Healing Moon Bears | Julie O'Neill Photography. For many the main attrac­tion of a trip to China is typically a visit to The Great Wall, for me it is a visit to Animals Asia Founda­tion. Thus, my very first stop in China was to Chengdu to visit Animals Asia and their sanctu­ary for rescued Moon bears. Since meeting the founder at an Asia for Animals confer­ence a few years ago I have been a huge fan of all that is Animals Asia and Jill Robin­son. It was at that confer­ence that I first learned of the horren­dous act of bear bile farming occur­ing in China (and Vietnam). 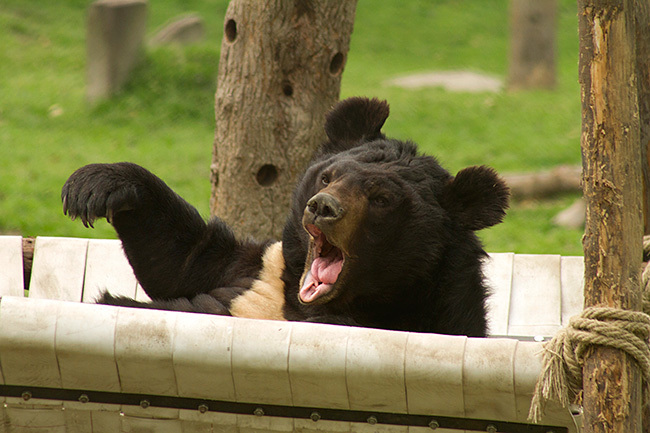 On bear bile farms bears are confined in coffin like cages for their whole lives, having the bile drained from their gall bladders through a metal catheter. The bears can exist like this for up to 30 years unable to stand or turn around. Most or the bears are riddled with injuries, disease and defor­mi­ties. The bile is in turn used in tradi­tional Asian medicine. The cruelty involved in this practice is astro­nom­i­cal and so is Animals Asia’s devotion to ending it. Jill founded Animals Asia in 1998 and since then has convinced 20 of main land China’s 31 provinces to become bear-farm free. 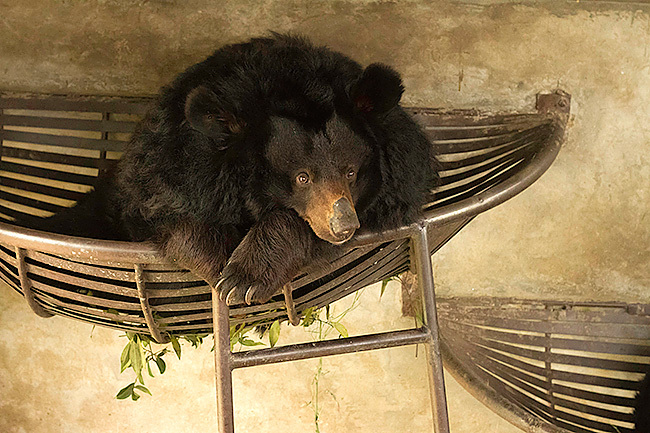 She has also opened sanctu­ar­ies for bears in China and Vietnam and has rescued 361 bears from bear farms. 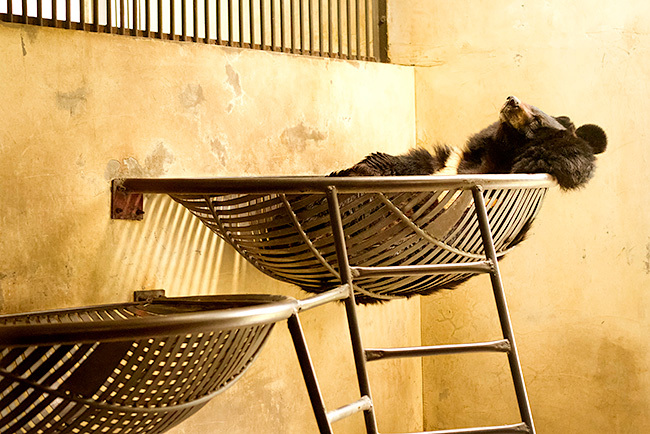 I was thrilled to get the oppor­tu­nity to witness first hand the work of Animals Asia and to meet the amazing rescued bears who live at the sanctuary. The beauti­ful face of a happy moon bear. Rescued from barbaric bear farms; days are now spent eating, playing and lounging. For years Quantock rubbed his face against the bars in his tight cage leaving his face perme­nantly scarred. At the sanctu­ary all of the girls find Quantock’s smooth face irresistable. He is one of the most popular bears with ladies. 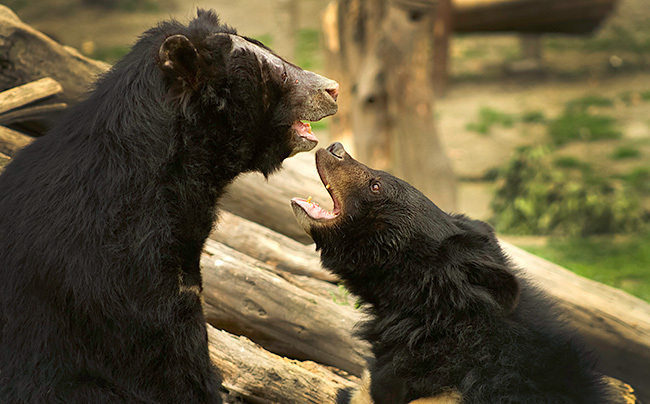 Occasion­ally the bears take a break from napping to sit up and yawn. 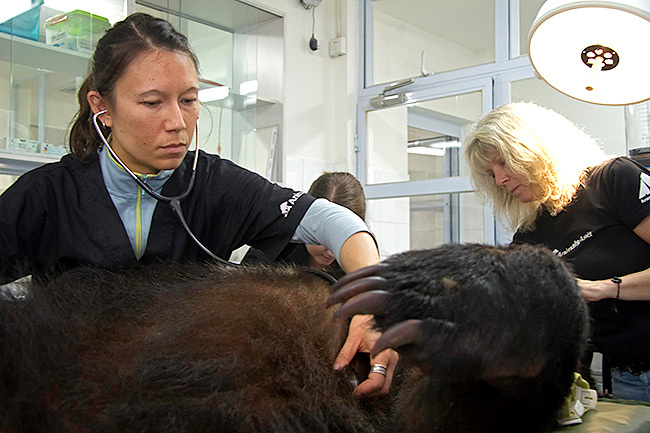 Regular check-ups must be performed on the bears because so many have long term health problems due to the years spent on the bile farms. 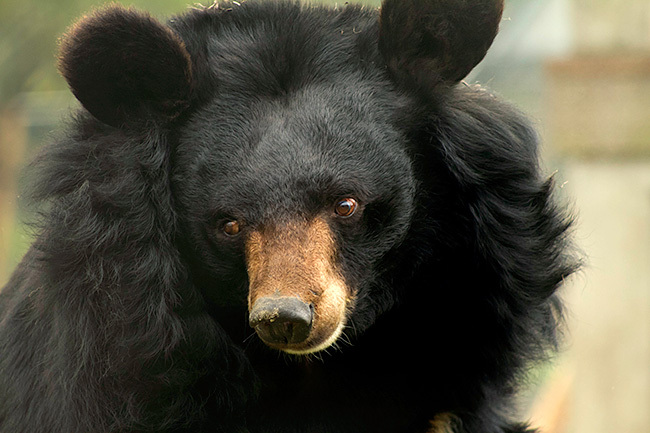 The beauti­ful full black mane of a female Moon Bear.. 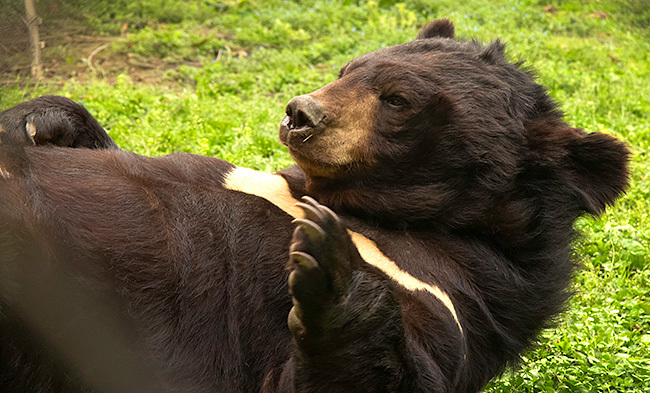 These days the bears spend much of their time decid­ing where to relax. Although the bears will only know comfort and love for the rest of their days it is impos­si­ble for us to how their past has emotion­ally scarred them. Oliver was kept inside a small coffin like cage for 30 years. He body is deformed with his legs being much too short for his large body. So far Oliver has enjoyed 2 years of freedom at Animals Asia and loves the sunshine and rolling in the grass. 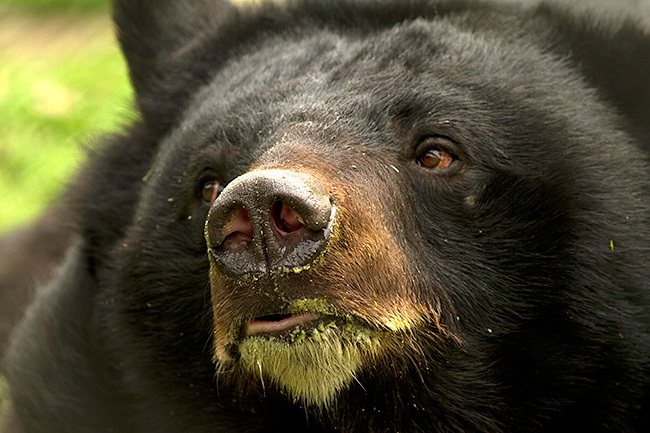 Each of the bears have lived through a horren­dous past on bile farms. It was heart­break­ing to see so many of them still showing phyis­cal and mental scars but watch­ing their grace­ful and forgiv­ing manner was inspi­ra­tional. What is equally as inspi­ra­tional is Animals Asia Foundation’s tireless and deter­mined work fight­ing Chinese bureau­cracy, tradi­tion and corrup­tion to end the suffer­ing and torture of these bears. 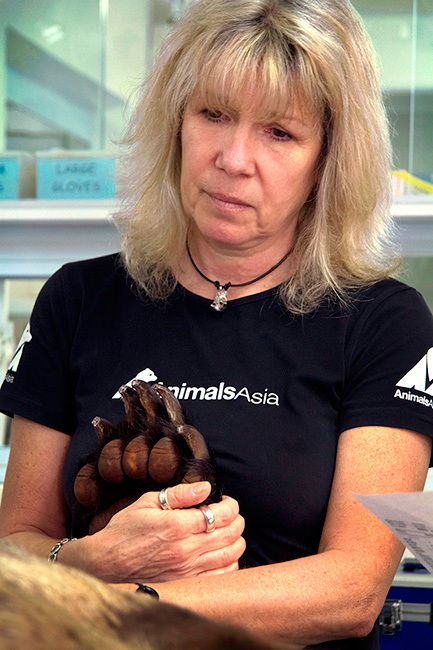 Thank­fully, Jill and all of those at Animals Asia are seeing results. The organi­za­tion is well known through­out China and more and more people are in support of shutting down bear farming for good. Visit­ing the bears in China was definitely the highlight of my travels through the country. I feel extremely privi­leged for the experi­ence and am especially honoured to have had the oppor­tu­nity to witness the true love and devotion that Jill Robin­son feels for these bears. I have heard her speak on a couple of occasions but seeing her with the bears was truly special. It is clear that she will continue the work that she started over 20 years ago and will not give up until bear bile farming is a thing of the past. This gives me comfort. Sadly, there are still over 10,000 bears impri­sioned on farms in China today, so the fight for their freedom is far from over. Please check out Animals Asia’s website for much more information. ‘All ears.’ — So very beautiful. Beauti­ful photographs taken by a compas­sion­ate and eloquent photog­ra­pher. 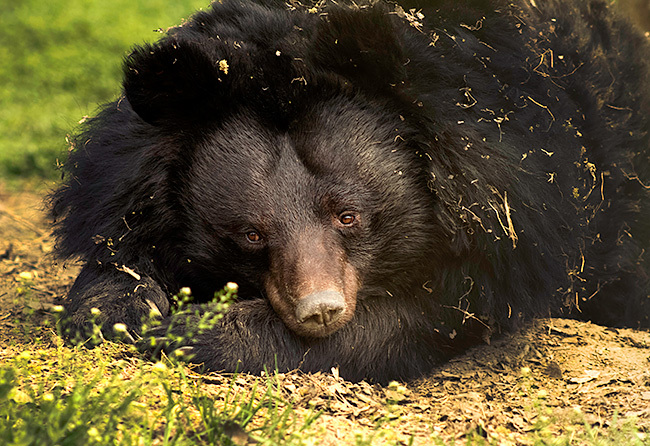 What a lovely record of the rescued bears, and so good to see such sincere support for the wonder­ful work being done by Animals Asia Foundation. I follow the work of Jill and her team helping these sad and tormented bears and hope one day there is no more bear farming. I believe Jill is a saint for the work she is doing to help the Moon Bears — and for every­one, animal and human hopes this cruel treat­ment of the bears stops soon. Love and best wishes from Australia. 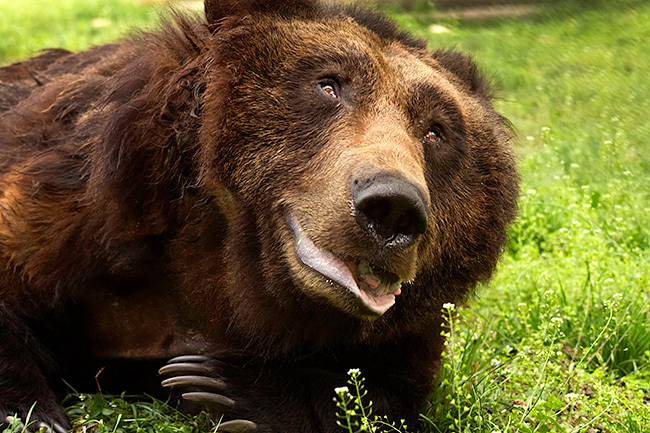 Thank you for sharing such evoca­tive pictures of our very dear bears. And congrat­u­la­tions for taking the message out to a corner of China to share the plight of these beauti­ful animals. I have supported Jill’s and AAF’s work for many years then decided I needed to do more to help spread the word. Thus began my website adopta­moon­bear. 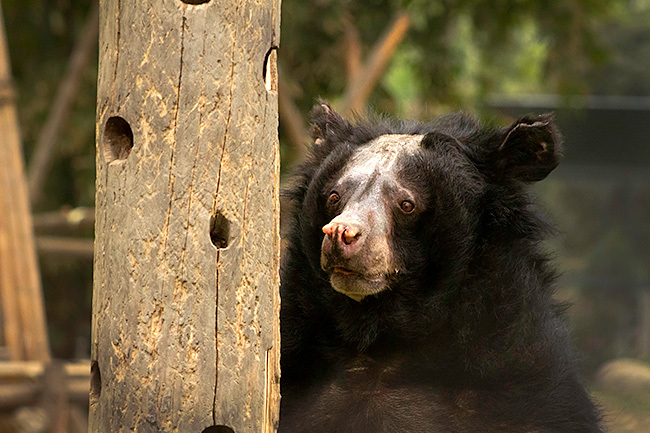 I raise money through the website for our gorgeous adopted bear JIGSAW who now lives happily at Tam Dao sanctu­ary in Vietnam. He is a very lucky bear who has a large “family” who care for him. Last year, along with a small group of his support­ers I had the privi­lege of visit­ing JIGSAW and I can’t speak highly enough of the caring people who work and volun­teer for AAF. I won’t ever forget the shame felt, and the apolo­gies offered, by our Vietnamese hotel manager in Hanoi at the treat­ment of moon and sun bears in his country. So there is hope! Through the wonder­ful commu­nity work carried out by AAF in Asia, animal welfare messages are being heard and, as their own standard of living and educa­tion improve, we can only hope that more people realise that animals, too, suffer from abuses inflicted upon them, just as people do. Great photos of the bears! I also follow the work of Jill & AAF. Sad to read there are still 10,000 bears being tortured.